With views over the marina to the Isle of Arran, 111 Mariners View is a spacious modern flat with open plan living area. The property benefits from allocated parking as well as plentiful visitor parking and a secure entry system. Entry is gained through a communal entrance hallway with secure entry system. The block of only eight flats has a lobby area on each level which is shared between two flats. The property accommodation comprises of entrance hallway with three storage cupboards. The family bathroom is modern and has a shower over bath and a small window allowing natural light. The master bedroom is a good-sized double (currently housing a super king size bed) and has built in mirrored wardrobes. There is a modern en suite shower room with small window. The second bedroom is a double room and benefits from a built-in storage cupboard (housing the central heating boiler). The open plan dual aspect lounge, dining area and kitchen is a bright spacious room offering a flexible living space. The modern kitchen has ample units and worktop space. There is a south facing balcony overlooking the marina. Externally there are communal garden areas and a residents parking area. 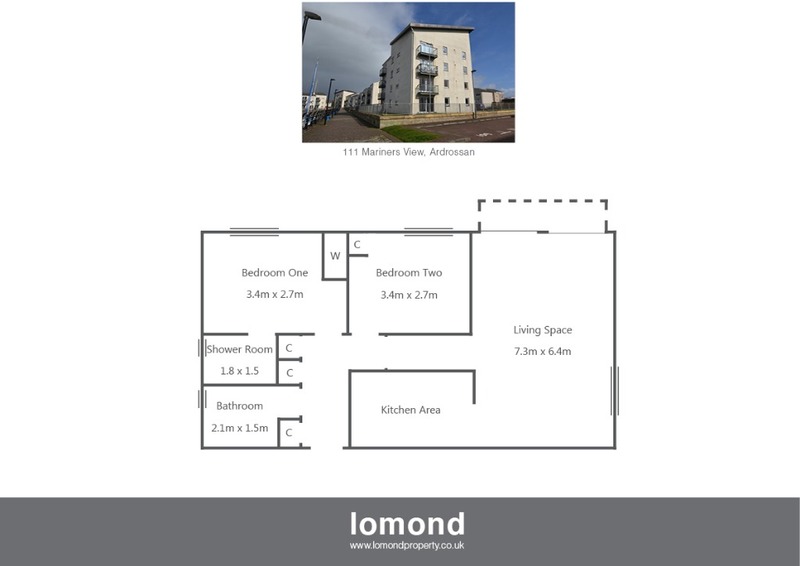 Mariners View is a sought-after location within easy reach of Ardrossan Town Centre. There are many amenities nearby such as supermarket, doctors’ surgery, chemist, dentist, and post office to name a few. Two of Ardrossan’s train stations are within walking distance of the property. There is also a good bus service to other Ayrshire towns and Glasgow and the nearby Ardrossan ferry connects the mainland to the Isle of Arran. On entering Ardrossan from the A78 by pass continue down Dalry Road and at the traffic lights turn left onto Eglinton Road. At the next lights turn right onto Glasgow Street. Continue to the lights at the bottom of the street and take right onto Montgomerie Street. Take second left into Mariners View and follow the road to the left and number 111 is in the last block.